Bike and Barge Germany - 3 Rivers! Our first Bike and Barge in Germany along the Main, Rhine and Moselle Rivers! Enjoy an 8-day adventure along the banks of three historic rivers. We will venture into the Bavarian countryside to explore beautiful orchards and meadows, visit vineyards and ancient fortresses. Not to mention we will immerse in the German culture- highlights, art treasures, folklore and regional gastronomy. Our trip starts in Afschaffenburg where we meet our boat at the town harbor- Flosshaven- in the city center. As we are not able to occupy cabins until 1 p.m., we will stow our luggage and head for a private walking tour in the city center. After visiting the Johannisburg- a massive 4-winged palace dating to 1605, we stop for a snack and head to the boat to fit bikes. We plan on a nice ride along the southern banks of the Main River before dinner. We head northwest along the Main bikeway through quaint villages like Selingstadt- one of the oldest towns in Germany. Here we'll be enchanted with winding alleys of red timbered medieval houses, the romantic marketplace featuring an ancient stone house built by Frederick Barbarossa in 1187, and orange brick-walled Einhard Basilica built in 840 AD. Next stop is Hanau, birth place of the famous Brothers Grimm. Here we'll take time to see the town, including the imposing castle-Schloss Philippsruhe, and enjoy lunch in its park along the water. A few more miles and we arrive at our port for the night- Frankfurt. The business and financial centre of Germany, Frankfurt's city centre, especially RÃ¶mer square, the cultural landscape and the museums at the River Main, draw millions of tourists every year. We plan an afternoon walk to give you a glimpse and history of the city then you are free to sightsee the rest of the day on your own. Tonight, you have dinner "on your own" and maybe head to the Fressgass- munching alley- a popular shopping area featuring many cafes and restaurants. We leave Frankfurt through the green outskirts criss-crossed with lovely forested bike paths. We rejoin the Main shoreline for a few miles and cross over the Rhine into charming Mainz- our stay for the night. Birthplace of Johannes Gutenberg, father of the printing press, Mainz dates back to around 38 BC, when the Romans built a citadel here. The city's gem is its old town filled with beautiful squares like Kirschgarten- framed by half-timbered houses, and narrow lanes like Kapuzinerstrase lined with houses featuring sandstone door frames and Rococo panels. We'll also explore the imposing Romanesque Cathedral, St. Ignatius Church and time permitting you can visit the interesting Gutenberg Museum. We hope to stay a bit longer in Mainz this morning to experience the festive Tuesday Market in town. Back on the bike, we pedal vineyards and wine villages through- Rheinhessen- also known as "The Land of the Thousand Hills, ideally suited for growing wines. In fact, about 3,500 wine growers in this region are producing some of Germanyâ€™s best white varieties. The Rhine itself is beautiful here- broadening to 1/2 mile wide with little islands formed through the ages of flowing water. We stop for a lunch break in the wine village of Eltville to see the fairy tale town and monastery Elsbach. Then only a few more miles to Rudesheim- our resting place for the night. Since the 1st century, the Romans were making wine here. The old town and fortifications are still intact and in the center you'll find The Droppelgasse- a small historic alleyway with a magical atmosphere- filled with historic buildings, restaurants, bars and shops. Please see for yourself in this YouTube video. Today we follow the Upper Middle Rhine Valley, an area of captivating hillsides and emposing castles dotting the landscapes. It is also part of a large UNESCO HERITAGE site. We will pass the famous Loreley- a slate cliff on the Rhine gorge in an area so deep and narrow that historically it's been one of the most dangerous passages for ships. The rock produces an echo and is associated with the legend of a beautiful maiden who threw herself into the Rhine in despair over a faithless lover and was transformed into a siren who lured fishermen to destruction. Time permitting we hope to visit the fascinating visitor center of the Loreley. Soon we arrive at our destination of Sankt Goar, a quaint village originally settled to save ships and shippwrecked mariners. Those who'd like will hike with Suzie to see the impressive Rheinfels castle and enjoy some Reisling at the nearby Phillips Meuhle Vineyard. Today we plan a cycling route along the banks of the Moselle to the the town of Alken and a visit to Castle Thurant. The oldest castle in the Moselle got its name from the occupation of the fortress of Thuron in Syria at the time of the Crusades. Thurant Castle was built on the site of a Roman fort in 1197 by the brother of King Otto VI, Count Palatine Henry, who had it built when he returned from the Crusades. After breakfast we say our goodbyes to friends and crew of the Allure. We hope you have planned an extension to see more of beautiful Germany! 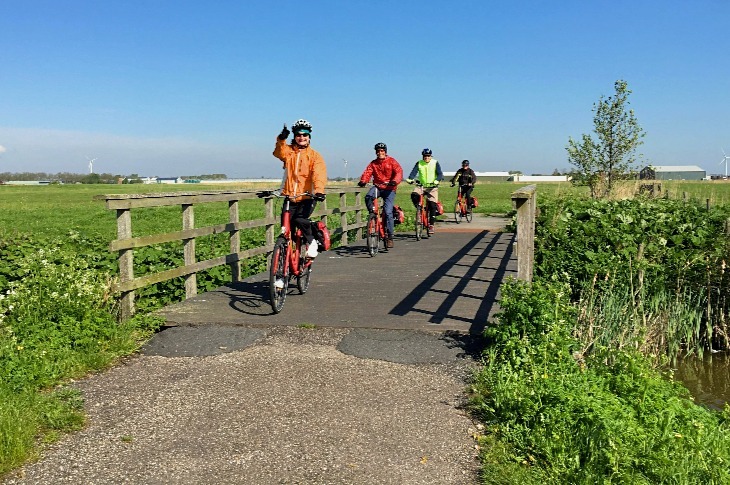 This trip is advised for someone of good fitness and recreational cycling ability who can enjoy 30 plus miles a day on flat to some varied terrain. The ride leader will be averaging a leisurely touring pace and we will have a ride sweep. Your arrival city is Frankfurt which is serviced by Frankfurt Airport located just a few miles from the city center. There are two direct trains from the airport to the city. We advise our cyclists to arrive at least a day early to acclimate to the time change and unhurredly get to the trip start in Afschaffenburg for our Saturday sightseeing plans. Our trip ends in Koblenz, Germany which is also serviced by Frankfurt International Airport as well as by the the extensive Germany train system. Suzie and Roger plan on extending their stay in Germany for at least a week if you'd like to participate in their plans. We are delighted to host our tour on the Passengership Allure- new sister ship of The Sarah. The ship has been remodeled to feature comfy cabins with private bath, a beautiful eating salon and lounging area, as well as full service bar. Captain Martien and crew welcome you onboard! The Allure has a reputation for its comfort and service to guests. Information about your trip, what to pack, pre-trip transportation and lodging in Frankfurt and Afschaffenburg, traveling abroad, tips on airfare, and other important pre-trip details will be provided in your WELCOME LETTER sent to you when we receive your registration for the trip. Please E-mail Suzie to inquire about openings and with any questions about the tour. We love to hear from you!